Sean Searles has been hunting and fishing since he was five years old. Sean hunts through all of the north east and the mid west. 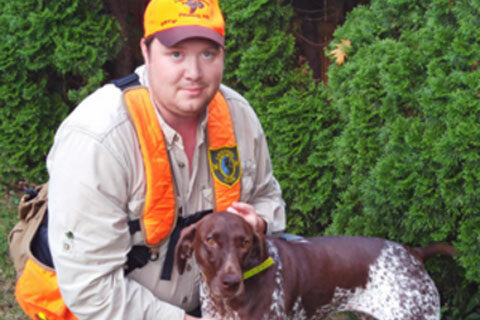 His goal is to hunt as many native, wild upland species in the US with his own dogs as possible. He has been upland bird hunting in Vermont, New Hampshire, and Maine for well over 12 years with extensive experience on pheasant preserve hunting, grouse and woodcock in the Great North Woods. Together with his two German Short Hair Pointers, Moonshine, Schultz, and his newest hunter Ada. Sean has been guiding in Vermont for three years and now in New Hampshire for three as well. Sean also has a passion for hunting deer, and duck hunting remote ponds and marshes in the back woods with small spreads and fast action.